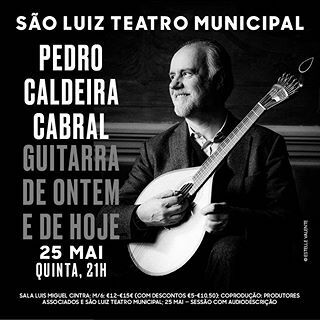 On May 25, at the Municipal Theater S.Luiz, in Lisbon will be held a concert "Yesterday and today's guitar" by guitarist Pedro Caldeira Cabral. This concert will have audio description and stage recognition. This show starts at 9pm. At 8 pm a wil take place a stage recognition given to spectators with visual impairment. "Pedro Caldeira Cabral, internationally recognized as a composer and multi-instrumentalist celebrates 50 years of his career, in a two-day event, with the theme of valorization and promotion of the patrimonial heritage of Portuguese Guitar. The Portuguese guitar, with its particular sonority and unique expressive resources. There is a past, a gift and a future that matters to know. Currently it is our only popular instrument whose transversality of use is expressed in the most diverse musical areas, from Fado to Ancient Music or from World Music to Jazz. " Gostou?- Did you like it?